ʹI am half dead by nowʹ says GN Saibaba who has been languishing in Nagpur Central Jail, being convicted in March 2017 for the ʹcrimeʹ of speaking truth to power. 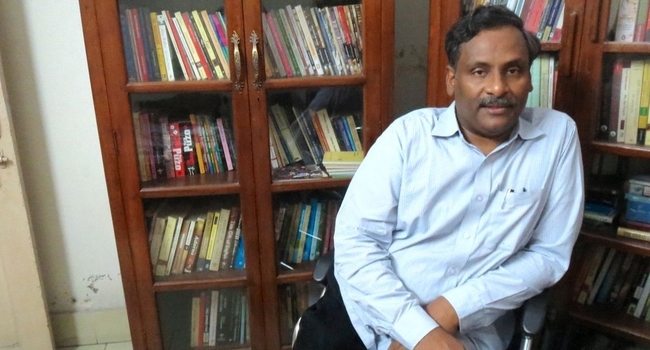 As a professor of literature in Delhi University and as a conscientious citizen of the country, he has, against all odds, been one of the most consistent voices against the manifold injustices that plague the society. He has been a tireless voice against the displacement and dispossession of Adivasis in the name of ʹdevelopmentʹ, read the state-backed rapacious and unsustainable loot of resources by corporate giants that are driven by greed. His continual incarceration and the repeated denial of bail to him despite evident and life- threatening ailments speak volumes of the decaying health of the democracy. Saibaba is a prisoner who is wheelchair-bound due to post-polio paralysis that rendered him 90% disabled early on in life. But none of these proved to be an effective obstacle when it came to serving his conscience. But years of incarceration, the oppressive prison routine and the failure of the authorities to provide him with proper medical care has severely impaired him bodily, even as he has tried to keep high his spirits. Even before his trial, he was diagnosed with maladies in the pancreas and gallbladder necessitating immediate surgery, which could not be performed due to his conviction. His situation has only worsened. He developed spinal problems and kidney ailments as well. ʹI have been experiencing unbearable pain in my damaged muscles of the left hand, frequent and complete blackouts, round the clock dizziness and heavy pressure in my brain, and sleeplessness due to the shooting pain. The drugs have turned ineffective. Even sedatives have stopped working on me nowʹ, wrote Saibaba a month back from his confines. ʹWe would like to remind Indiaʹ, said the statement, ʹthat any denial of reasonable accommodation for people with disabilities in detention is not only discriminatory but may well amount to ill-treatment or even torture. In particular, solitary confinement should be prohibited when the conditions of prisoners with disabilities would be made worse by this measure.ʹ Calling Saibaba ʹa long-standing defender of the rights of various minorities against corporate interests,ʹ the UN experts urged the state to guarantee that all human rights defenders the country ʹare able to conduct their legitimate work without fear of threats or exposure to any act of intimidation or reprisals.ʹ With the rounding up of prominent defenders of democratic rights under the draconian UAPA, or even the killing of many, the last few years have seen a severe curtailing and silencing of democratic dissent by way of branding, threats and intimidations. Such is the health of this democracy today that while the likes of Saibaba are refused bail by any means despite his failing health, the likes of Babu Bajrangi, the scourge of Gujarat, convicted for the heinous massacre of Naroda Patiya (2002), however, is easily granted bail citing health grounds. In such a context, the body-politic of this country will get into permanent coma, unless it is infused with the oxygen of dissent, of protest, of reason. Our voices in defence of Saibaba, and against his unjust incarceration and the denial of bail, are ultimately all voices in defence of the democratic health and wellbeing of the country.